TOKYO NATIONAL MUSEUM - Collections The TNM Collection Object List Incense burner with handle in shape of "magpie's tail". Gilded brass. >> Incense burner with handle in shape of "magpie's tail". Gilded brass. 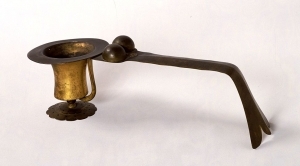 Incense burner with handle in shape of "magpie's tail". Gilded brass. Overall L. 39.0, mouth D. of burner 13.3, H. 10.2.